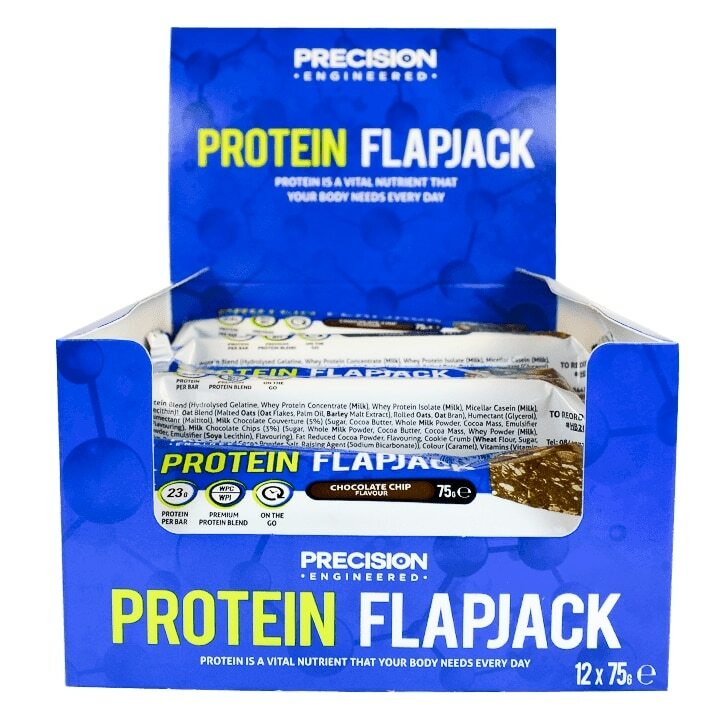 Our Precision Engineered Protein Flapjacks are a great tasting high protein snack with rolled oats. Our premium blend ensures each bar contains 23 grams of protein which assists in the maintenance of lean muscle mass and 38 grams of carbohydrates. Each bar is 75g. Protein Blend (Hydrolysed Gelatine, Whey Protein Concentrate (Milk), Whey Protein Isolate (Milk), Micellar Casein (Milk), Emulsifier (Soya Lecithin)), Oat Blend (Malted Oats (Oat Flakes, Palm Oil, Barley Malt Extract), Rolled Oats, Oat Bran), Humectant (Glycerol), Glucose Syrup, Humectant (Maltitol), Milk Chocolate Couverture (5%) (Sugar, Cocoa Butter, Whole Milk Powder, Cocoa Mass, Emulsifier (Soya Lecithin), Flavouring), Milk Chocolate Chips (3%) (Sugar, Whole Milk Powder, Cocoa Butter, Cocoa Mass, Whey Powder (Milk), Skimmed Milk Powder, Emulsifier (Soya Lecithin), Flavouring), Fat Reduced Cocoa Powder, Flavouring, Cookie Crumb (Wheat Flour, Sugar, Vegetable Fat (Palm, Rapeseed), Fat Reduced Cocoa Powder, Salt, Raising Agent (Sodium Bicarbonate)), Colour (Caramel), Vitamins (Vitamin C (as Ascorbic Acid), Vitamin D3), Activated Barley Flour. Precision Engineered Protein Chocolate Chip Flapjack is rated 4.6 out of 5 by 7. Rated 5 out of 5 by Lovell from The nicest protein bar I have ever tried! Only bought one bar at the time so I could test it. It was lush, tasted just like a normal chocolate bar without the naughtiness! Haven't been able to get hold them since, which is generally a good sign! Can't wait for them to be back in stock. Rated 2 out of 5 by gcmiles from Not amazing This bar nearly took my teeth out! It tastes good, but it is so dense and hard to chew. Rated 5 out of 5 by Fabover50 from Great Tasting! Great pre/post gym snack, dense and chewy, tastes good. Everything you need from a protein bar. Rated 5 out of 5 by DeeM from Very chocolatey and satisfying, perfect after a workout. Great and thick snack. Rated 5 out of 5 by Flowerpowerlife from Chewy & satisfying This is really tasty and lasts for ages - being a protein bar, it is very dense, but it is very satisfying.